Microchip announces technological advancements and the increased adoption of complex electronics systems in modern vehicles requires superior timing performance and reliability. Timing precision, accuracy and tolerance to harsh environments are essential to ensuring precise operation in today’s highly-advanced automotive systems. 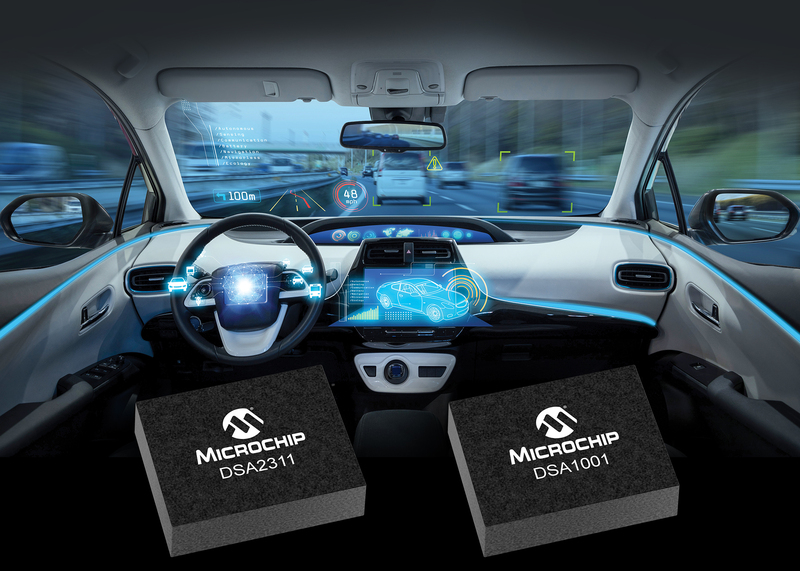 Microchip Technology has unveiled the new DSA family of automotive grade Micro-Electro-Mechanical Systems (MEMS) oscillators that provide 20 times better reliability, 500 times better tolerance to shock and five times better vibration resistance than traditional quartz-based crystal devices. The DSA family also includes the industry’s first multiple output MEMS oscillator, offering customers a solution that can replace multiple crystals or oscillators with one device. To learn more about the new automotive grade MEMS oscillators and clock generators, visit www.microchip.com/timing/automotive. Timing solutions with tight frequency stability over a wide temperature range are critical for applications such as Advanced Driver Assistance Systems (ADAS), Light Detection and Ranging (LiDAR), in-vehicle Ethernet and autonomous driving. Available in small package sizes, Microchip’s new DSA1001, DSA11x1, DSA11x5 and DSA2311 offer the highest tolerance to mechanical shock, jarring and stability in harsh environments over a frequency range of 2.3 MHz to 170 MHz. The devices are Automotive Electronics Council Q100 (AEC-Q100) qualified with +/-20 ppm stability over temperatures ranging from -40 to +125 degrees Celsius. MEMS oscillators are built entirely with standard semiconductor processes, bringing systems the same reliability and stability as integrated circuits. Crystal oscillators rely on the thickness of the crystal blank inside the oscillator, making them susceptible to vibration damage with longer lead-times and fixed frequency. This can delay product development or release times if a customer needs to make a last-minute frequency change. MEMS oscillators achieve frequency through programming, giving them flexibility to quickly support new frequencies with shorter lead times, as well as to ramp in volume to help customers meet product launch schedules. As the industry’s first dual output MEMS oscillator, the DSA2311 can replace two crystals or oscillators on a board. The device addresses board space limits, saves costs and eases the design process, enabling customers to manage their supply and consolidate their bill of materials. The DSA2311 comes in a concise 2.5 mm x 2.0 mm package and is well-suited for applications that require a complex board with multiple controllers, such as infotainment systems and camera modules. The DSA MEMS family of devices join Microchip’s comprehensive portfolio of automotive solutions, including microcontrollers, analog products and connectivity components, giving manufacturers the ability to consolidate suppliers for system needs. All products are backed by Microchip’s customer-driven obsolescence policy which ensures that devices will be available for as long as customers need them. Microchip’s ClockWorks® online configuration tool allows designers to order free samples and easily select the right oscillator based on frequency, package size and temperature range at clockworks.microchip.com/timing. All products mentioned in this release are available now for sampling and in volume production.